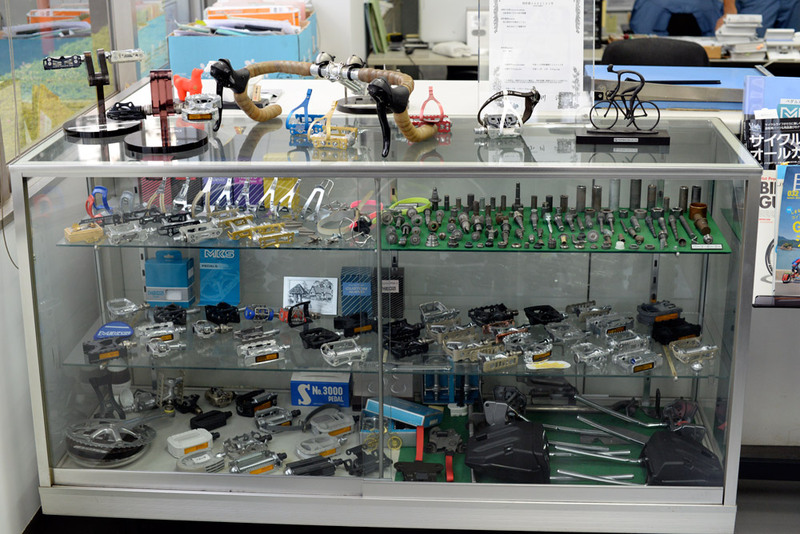 During our recent visit to Japan, we had the privilege of visiting Mikashima Industrial Company, better known as MKS, the makers of bicycle pedals. We had expressed an interest in MKS to our trading company. Fortunately, the MKS’s president, Toshiyuki Ogino (right), had heard about Bicycle Quarterly and was also interested in meeting us. MKS is remembered by many for making many wonderful pedals for SunTour, but even after that great component maker disappeared, MKS continued to make great pedals. We were surprised by the wide range of products that MKS makes. Bicycle pedals are only half their output. 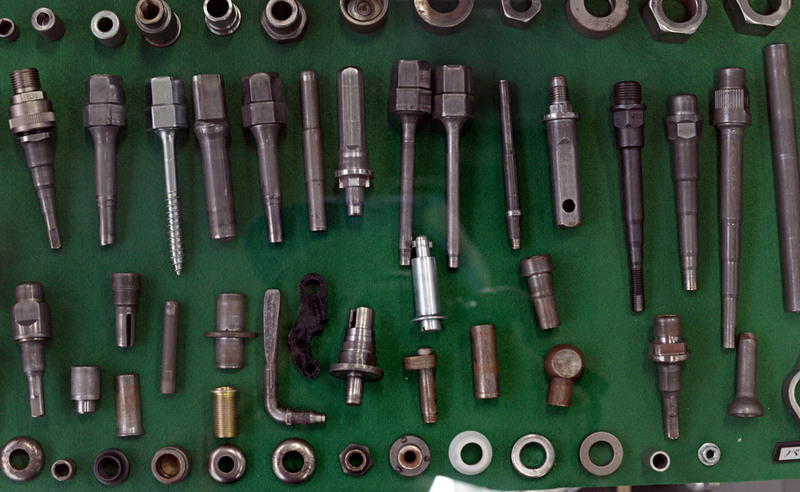 The remainder appears to consist of parts for the automobile industry. As we enter the first building, one machine is stamping toeclips out of large sheets of steel. It reminds me of making shape cookies with cookie cutters. The toeclip shapes fall into bins, while the left-over steel sheet now has toeclip-shaped holes. It’s fun to watch. Another machine is forging parts for truck diesel engines. We suspect they are fuel injectors, but it’s too loud in here to ask many questions. And what is “fuel injector” in Japanese, anyhow? The assembly building is much quieter. One room has an assembly line for the aforementioned Subaru headrests. The next room has a single employee assembling the top-of-the-line Keirin pedals. He is wearing white gloves, and next to his workstation are small bins with paper-thin shims. The pedals are equipped with cartridge bearings, but the end play is adjusted with these shims, in 0.03 mm increments. (That is 1/1000 of an inch!) The employee screws in the locknut, checks the play, then removes the nut and installs the next-bigger shim. He repeats the process until the bearing adjustment is perfect. It’s labor-intensive: While we watch, we see only a single pedal being completed and put aside for packing. We pick up the pedal. Feeling the bearings spin oh-so-smoothly is an object lesson in quality. I want to get a set to keep on my desk and to play with from time to time, to inspire me to insist on the best quality as I am working on our own Compass components. The pedals have many neat features. The cages are cut away to save weight, yet they support the feet in all the important places. There is a lock for the toe strap, so the old technique of twisting the straps as you feed them through the underside of the pedals isn’t necessary – the straps will stay in place no matter how often you open and close them. Even with a spindle made from strong boron steel, the RX-1 pedals are as light as the classic Campagnolo Super Record pedals with their titanium spindles. And the cages are replaceable, since they’ll wear over time where your cleats touch them. The next, much larger room houses the assembly for the less expensive MKS pedals. The contrast to the quiet, unhurried pace of the top-of-the-line pedal assembly is remarkable. The less expensive pedals are assembled by hissing pneumatic tools. The finished pedals drop into buckets with loud clanks. Even here, an employee checks the final bearing adjustment by hand. When we feel a pedal, it’s clear that these pedals will need to “break in” as you ride. The Keirin pedals, on the other hand, have silky-smooth bearings right out of the box. “Right out of the box” – once you figure out how to open the box! You open the top flap, and then flip open the box like a book. Each pedal has its own little compartment. The smooth lacquered paper stock and tasteful finish ensure that you’ll find a reason to keep this box even after you have installed the pedals. Keirin racers use toeclips and straps, so MKS also makes what I think are the best toestraps. (And yes, I’ve used Binda Extras and most other famous brands of the past.) Two layers of glove-soft leather sandwich a layer of anti-stretch Nylon. That way, you don’t have to cinch down your toestraps until they cut the circulation in your feet. Adjusting them to a comfortable snugness is enough to prevent your feet from coming out of the clips even when you climb out of the saddle (or sprint in a Keirin race). I am on the fence about toeclips and straps. On the one hand, I love the classic appearance and incredible quality of these MKS components. I have a set of touring bicycle shoes that work with toeclips and allow me to walk. But for all-out efforts, I prefer a more rigid connection to the pedal, which requires cleats that make walking difficult. So for randonneuring, I prefer SPD-style pedals and shoes. If you have several bikes that you enjoy for their different feel and ride, at least one of them probably should have traditional pedals. 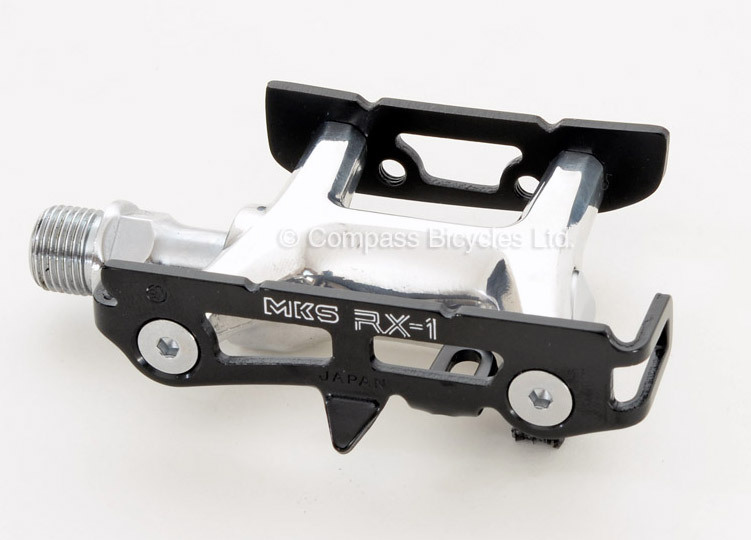 I am tempted to put a set of the MKS Keirin pedals on my Alex Singer camping bike. For riding in street shoes, half-clips are a great option. They locate your feet during the downstroke (which is where you put out all your power anyhow). And on bumpy roads, they prevent your feet from sliding off the pedals. MKS makes these lovely “Cage Clips”, which are welded from steel rod, rather than stamped out of flat steel sheet. Not only are they beautiful, but they also don’t have sharp edges that can scratch your shoes. And they are made from stainless steel, so they won’t rust even if you scratch them up a bit as you start from a stop with the pedals flipped upside down. 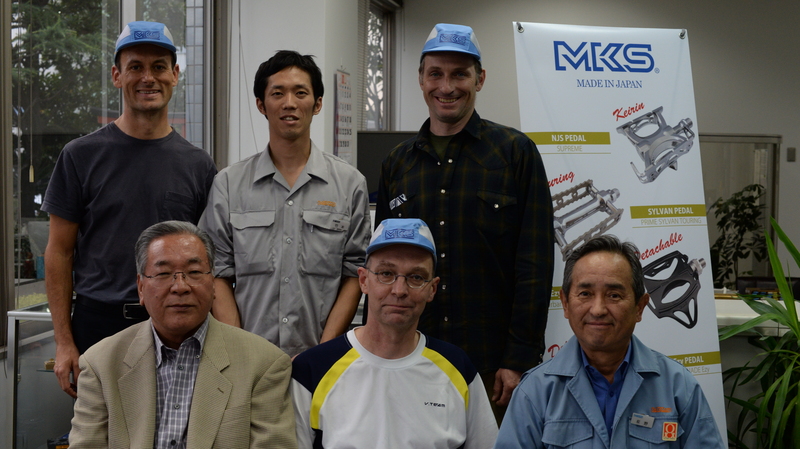 After the factory tour, we meet with the engineers and the president of MKS. We decide to import some of the pedals, straps and cages that MKS already makes. And we hope to collaborate on future projects. Wouldn’t it be nice if we had a true randonneuring and cyclotouring pedal designed for long-distance comfort and longevity? The adapted mountain bike components we use today have mud clearance we don’t need, and the down side is a small cleat that puts more pressure on our foot and wears out quicker than is ideal. In the mean time, click here for more information on the MKS components we sell. Good luck with your future collaboratons! Lake used to make a touring shoe with a walkable sole that would take a Look style 3-bolt cleat. The sole was too stiff to comfortably walk any distance, but they worked better off the bike than standard road shoes, and better on the bike than two-bolt cleats. I guess they weren’t selling, because they were discontinued as far as I can tell. After 20,000 miles you just put in new bearings and fresh grease and you have a new set of sweet pedals. These are my most popular seller and they only get better with use. Paired with Nitto bar, stem and post they complete a very beautiful and SAFE bicycle. I assume you are talking about the less expensive MKS pedals. 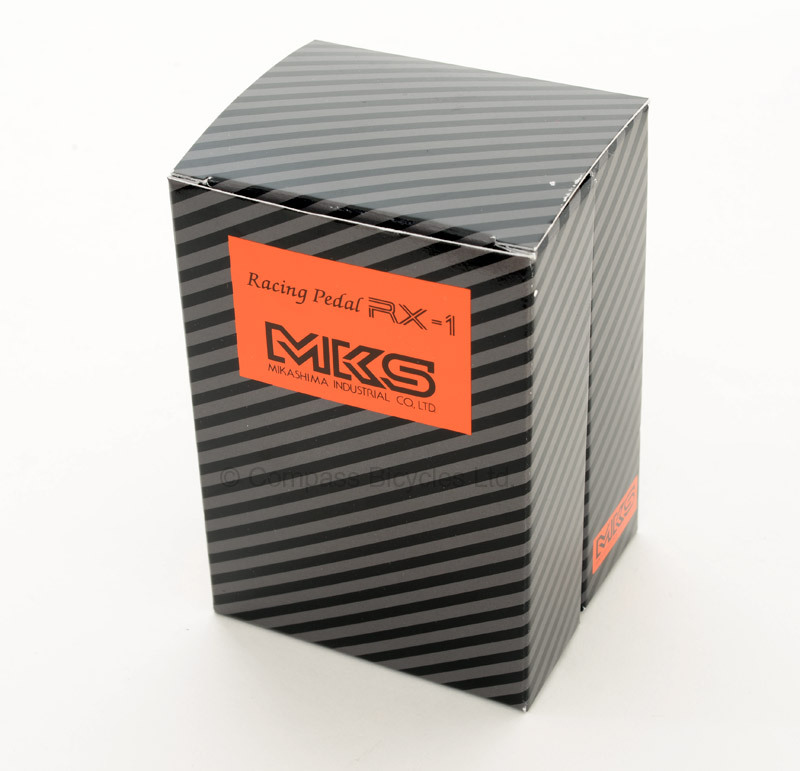 The bearings in the top-of-the-line MKS pedals we sell should last a lot longer than 20,000 miles (and spin a lot smoother). Great looking pedals. Kudos on the new line-up! If I could ask, any thought to Compass offering a traditional rat-trap (MKS Touring, aka Sylvan Road) pedal fabricated to the same level of craftsmanship as the RX-1? This would allow for Hold Fast FRS straps which work great for urban riding. We’ll expand the pedal lineup in the future. However, we don’t have plans to import the lower-quality pedals, it’ll take time to work with MKS to develop the pedals we want. Sounds like a good plan – thank you! Having a top shelf rat-trap pedal paired with Hold Fast straps would be the cat’s pajamas for the NYC commute. The welded steel rod half-clips look beautiful and are compelling me to try them on the MKS Sylvans on my city bike. But in the description above, you state they are made from stainless steel. On your Compass site, it states they are made from chrome-plated steel. Are they chromed steel or stainless? Thank you for catching that error. The Cage Clips (half-clips) are stainless, the standard toeclips are chrome-plated. Love that Lyotard-like pedal with the cool wire clips! MKS always made incredible stuff. Like you I’m an SPD rider – but glad you are offering these classic pedals for sale. Nice. Even better, the MKS Urban Platform (the Lyotard-Berthet clones) are big enough to fit people who aren’t 5’6″ and 140 pounds. And I’m betting the steel is a lot more durable than Lyotard-Berthets, too; the kicktabs on those oldsters bend if you look at them crosseyed. You know what you could do to perfect the Urban Platform? Do the same bearing upgrade everyone’s advocating for the Sylvan Touring, and raise the rear rail a few millimeters so it’s high enough to grab onto a slotted cleat. I’d love to see a high-quality pinned platform pedal, like the VP-001 or VP Vice, but with smoother bearings. For riding in street shoes, I find these much more comfortable than cage clips or any other kind of retention device, and I have never had problems with my feet slipping on a pinned pedal. After riding the Cino Heroica in Montana on my fixie retrofitted with the archaic pedals with clips & straps, I have confirmed my belief that clipless pedals are one of the greatest advances in cycling technology ever devised. Even with a high bottom bracket (60mm drop), you still get the clip scraping on startup. The back foot pulls out on climbs, even with the Binda Extra strap cinched up. Back in the 70’s, it was a common belief that training with untightened straps helped you develop more “circular pedaling,” and I’d even climb out of the saddle with the straps loose. Oh, and then there’s the different protocol for getting your foot out of the pedal when you stop. All in all, a technology that I wish would go away, with all due respect to those who ardently (and I’m sure justifiably) disagree. In my opinion, the best pedal ever made was the original Shimano Ultegra SPD road pedal. Single-sided, but small and tough, easy to get in and out of, and perfectly compatible with SPD mountain pedals despite Shimano’s warnings. I rode PBP, LEL, Trona 353, Hoodoo 500, etc. all on these pedals. In the winter, I just switch over to the double-sided Shimano MTB pedals and use the same set of shoes. Great for standing starts in snow, you do need the mud-clearing capability when the bottoms of your shoes are covered in snow and ice. I’ve been experimenting with the new A520 and its Ultegra equivalent (a road SPD with the addition of a wider platform for more foot support), but really, I’ve never had any issue with the smaller pedal’s “footprint.” It’s all in the shoe’s stiffness, and I’ve been using Shimano’s RT80 and RT82 with no problem whatever. And unfortunately, there simply aren’t any clipless pedals that offer the same quality as the top-of-the-line MKS pedals. Aren’t the Keirin racers using locking cleats that have a nose-piece engaged with the pedal in addition to the slot? The vast majority of modern toeclip users are in sneakers, and wondering why the pedal cages are so prominent and uncomfortable! You really ought to take a look at the insides of modern high end Shimano pedals, the quality is incredible. The preload adjustment is entirely separated from the custom bolt that holds the body onto the spindle. The whole spindle and bearing assembly can be cleaned and adjusted outside the body instead of in that confined space. You are right, MKS makes a locking cleat with a little lever. It locks into the rear of the pedal cage – a photo is here. So I have to take it back that Keirin racers don’t come out of their toestraps… However, generations of racers, including the incredible Eddy Merckx, rode with clips and straps and didn’t come out of their pedals, so I still think it’s not a concern. The older style pedals used a set screw the keep the strap from slipping. thanks for the trip report! Very interesting. I’ve been a user and fan of MKS pedals for quite a while and was pleasantly surprised to learn that MKS made the SunTour Superbe pedals that I’ve got on 2 or 3 bikes. It also explains the shims that I found in those pedals when I’ve needed to tear them apart. Wonderful pedals! I do use their Campy Record copies on a couple of my vintage bikes. No sense wearing away the black anodizing on my Campy SL pedal cages when the MKS work as well. The only odd thing is that these more basic MKS pedals always arrived with the bearings distinctly tight. I don’t have a problem with adjusting pedal bearings, but it seemed that the tightness would quickly damage the bearing cups and cones. Hard to believe that this tightness was intentional. The basic MKS pedals are sold at a very low price, so they cannot put as much care into their manufacture. That is why we don’t carry them. Of course, if you adjust them yourself, and perhaps replace the grease and the ball bearings after the bearings have ground themselves in, they will be fine. I’ve been using MKS pedals on at least one of my bikes since buying my first set of alloy BMX pedals in 1980. I still have that battered old set along with 4 or 5 other sets of BMX, road and MTN Bike pedals. I guess all my SunTour XC Beartraps are too, who knew? The cool trick for breaking in ball bearing pedals back then was to remove all the grease and replace it with jewelers rouge or some other really fine polishing/grinding compound, then hold the threaded portion of the pedal against the spinning rear tire of your upside down bike while someone turned the pedals by hand as fast as they could. The initial whine would quickly quiet down to a smooth hum and you were ready to disassemble, flush out the compound and put fresh best grade balls in place of the factory ones. Fresh Campy grease and a careful adjustment and we were convinced we had the best pedal to be had. I suspect it wouldn’t have been necessary if their BMX Pedals were made to the same standard as their best road models. I just bought another set of those old style MKS BMX pedals for a vintage MTN Bike project and they don’t feel any better than way back when, I guess I’ll get to do that old trick one more time and see if it really helped as much as we used to think it did. Congratulations on the latest addition to Compass offerings. 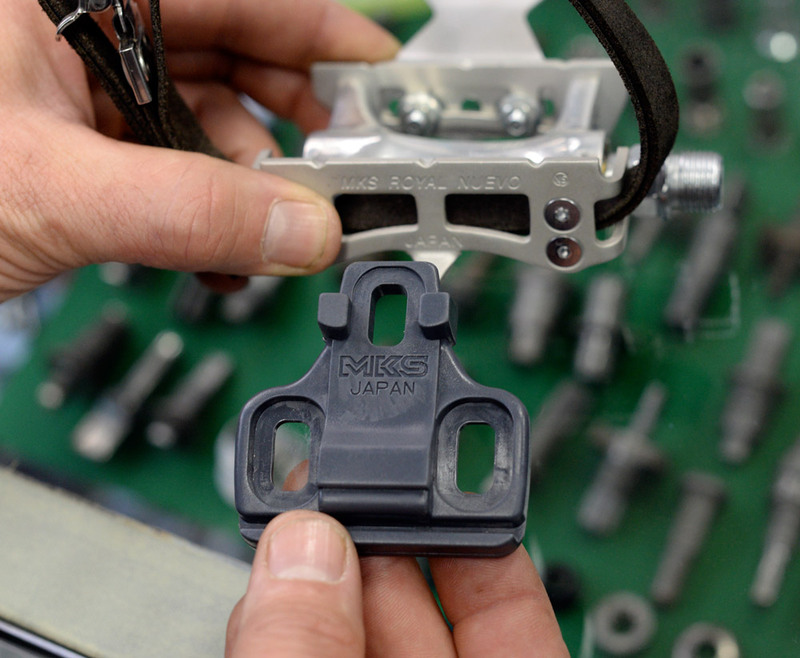 For folding bikes, and someday, a rinko bike, I’m a fan of MKS pedals using the Ezy-Superior coupling. (http://wp.me/p1iGqw-14e.) I know you don’t carry them, but if you ever get a chance to ask, I’d love to know why MKS doesn’t offer a clipless pedal with the same coupling (instead of the original Ezy coupling). We are working on a range of Rinko pedals… Stay tuned! 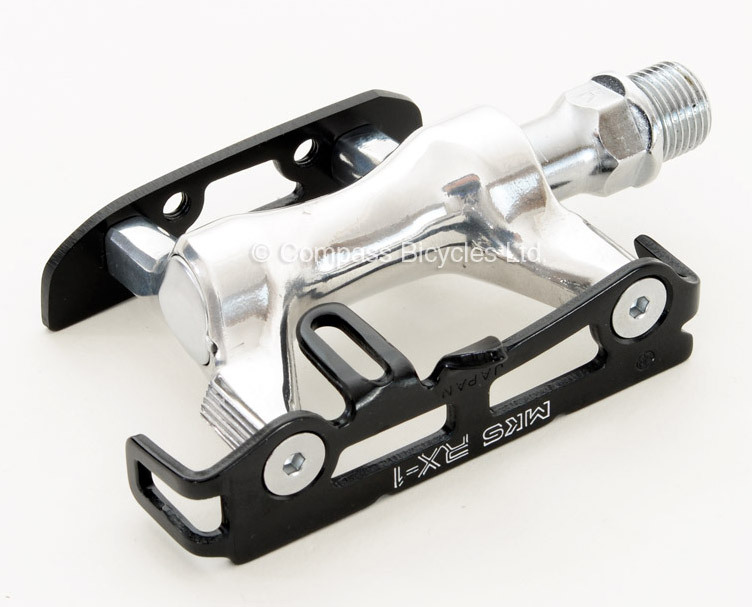 A better question is why the Cube pedals (made in both a standard and Ezy version) from MKS use a cleat that is just different enough that you can’t use Shimano or Wellgo cleats with the Cube pedals. I have the Urban Platforms and mostly like them. The GR-9 are easier to clip in and out of. I thought the larger tab on the platforms would be easier, but it’s not because it’s even with the top of the platform so is harder to access when the pedal is hanging down. The GR-9 tab is lower on the pedal, creating a compound lever when the pedal is hanging down. The Urban Platform has a larger surface space for the foot, which provides more comfort. I like to wear thin-soled lightweight “Barefoot” shoes. These pedals also look nicer. This seems like a good topic for a BQ article: What makes a good pedal? In the 1970s the standard was Campagnolo Record with toeclips, straps and leather-sole shoes with nail-on cleats. With the advent of the mountain bike, plastic toe clips and aggressive pedal cages became popular. Clipless pedals were a great revelation, or so it seemed. In retrospect, each of those once-accepted standards seems of questionable value. My preference has evolved in response to market trends and personal experience. Toe straps restrict circulation. Narrow cages and cleats cause hotspots. Clipless pedals, unlike flat pedals, can cause knee pain, even with orthotics, wedge-shaped cleat shims, etc. Flat pedals can develop hazardous sharp edges, and can be slippery unless they have pins. Pins damage shoe soles and are a physical hazard. My fleet of bikes has all of the above, but the bikes with flat pedals get ridden the most. Whether riding alone or with a group, no particular choice gives a perceptible performance advantage. My vision of an ideal pedal is one with a concave shoe interface with replaceable abrasive rubber inserts. Bearings also deserve examination. Given the dynamic loads that bearings sustain, does preload (slight tightness) even matter? What currently available shoes work well with toe cages and straps? I use some lace-up touring shoes, but they are large and heavy. Velcro straps on higher-end shoes get caught on the cages. MKS Sylvan pedals become very smooth after a bit of riding. A quick touch-up with a file takes care of that. 1) My feet are big; too big for MKS’s extra-large deep toe-clips. But perhaps the Cage Clips are malleable? 2) I like to wear leather shoes, and my commute is too short to make it worth changing. So I try to minimize abrasion. 3) I feel a lot safer with foot retention, plus it’s convenient for returning the pedal to starting position after a stop. Right now I’m using velcro straps, but they’re pretty homely and still rub on the sides of the shoes, causing unnecessary wear. Would the Cage Clips cause less wear? Do they provide enough retention to make a meaningful difference in a situation where one is in danger of losing it? The Cage Clips are a lot taller than even the LL toeclips. They are a perfect fit with my light “dayhiking” shoes. You probably can bend the clips further, but I doubt it would be necessary. Jan – Have you (or perhaps one of those reading here) had the chance to compare the MKS half clips with the similar looking King Cages? Currently I use Bruce Gordon half clips in order with White Industry, RX-1 and a set of vintage Campagnolo Record pedals on my city, touring and road bikes. I tried using the King Cages as half clips a but ultimately went back to the Gordons. The problem with the King Cages is they are designed for straps, so a bit long to use as half clips. Especially when riding the city bike where I have to make frequent stops for traffic signals, I would sometimes wind up stepping on the top of the clip rather than stepping into it when trying to get going. Certainly not optimal when riding through a busy intersection with cars, trucks, pedestrians and other cyclists all competing for my attention. In the pictures at least the MKS appear to open in front of rather than over the pedal as do the Kings. I haven’t used the King Cages, but the MKS half-cages are easy to get into. They do end in front of the pedal. Is it difficult to design a folding pedal without widening Q? I think folding pedals would be the optimal solution for Rinko and also car racking. Anybody know of a good, lace-up touring shoe? Something a little less expensive than a set of Dromarti? I was looking at some new Giro offerings but they could not be adapted to work with toe clips/straps. Vittoria 1976 are good quality lace up shoes designed to work either with cleats or toe clips. I can second that. We tested a pair a few years back, and they worked well. They probably would have worked even better with toeclips, where their slightly soft feel wouldn’t have mattered so much. I’ve been using some basic Shimano lace-up SPD touring shoes. The ones that I used to ride to work today are the SH-M021 model (and are probably 8 years old). I did have to file down the lugs on the soles in order for them to slide into the pedal better. The lugs had a tendency to catch on the pedal cage otherwise. Oh.. and of course, don’t take off the cover for the SPD cleat mounting holes. You are so correct regarding the durability of sealed bearing pedals. 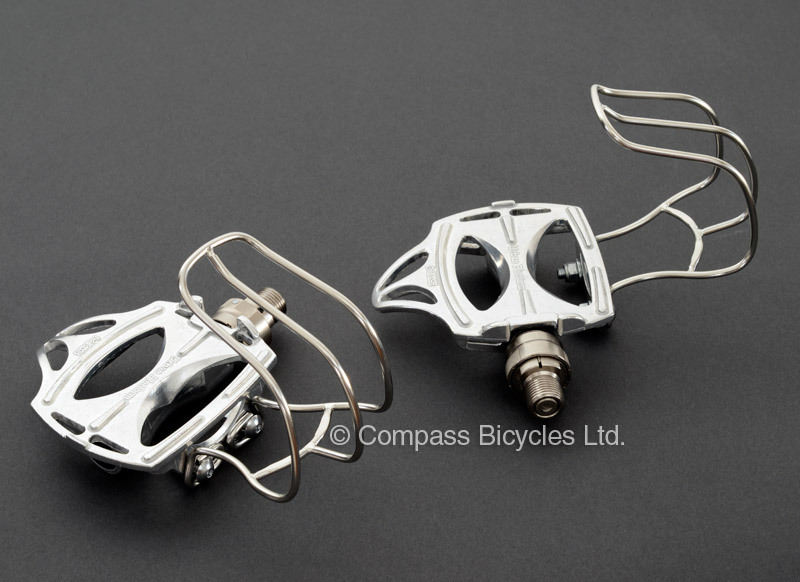 I had a pair of Superbe Pro pedals on which I’d swapped out the road cages for MTB cages (perfect bolt hole fit) and they were on a bike I rode a lot! from 1983 until I sold it this past summer. Never did they need service or any kind of adjustment. Both my current commuter bikes are equipped with Suntour XC Pro GreaseGuard pedals and they, likewise, are smooth as silk and have never needed more than an occasional squirt of grease. I had no idea they had been produced by MKS. No wonder I’ve always liked their pedals. I love MKS, but I’m really glad you’re working with them to develop a nice clipless pedal. Their “urban step-in” clipless pedals left a lot to be desired. I did like that they used ATAC cleats, though. I use Nike leather sneakers with MKS Touring pedals – no straps or clips. I used to use clipless pedals but I like the freedom of being able to move my feet around on the pedals. And also the great feeling of hopping off the bike and being able to instantly walk in regular shoes. Jan, is your name pronounced “Yahn/Hy/nuh”? My name is pronounced “Yan” or “Yann” with a short “a”. Timely post: I just installed the pictured MKS Urban Platform pedals (standard w/o EZY) I got myself as a christmas present, because they have much better bearings and looks than the pedals I had before (MKS AR2). I am a bit disappointed however in that they seem to have a significantly wider tread / Q-factor than the AR2s. There is quite a bit of axle showing to the left of my right shoe now. Would it help to file away the two “hooks” on the inside of the platform?